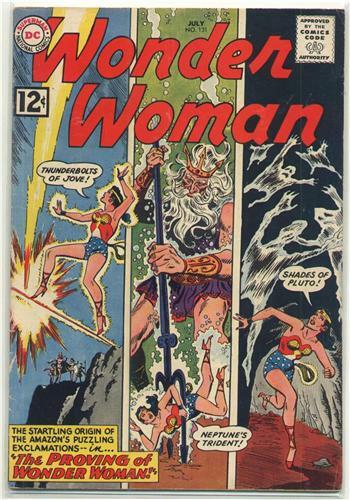 "The Proving of Wonder Woman"
Wonder Woman reveals the origins of her oft-used expressions! "Wonder Woman's Surprise Birthday Gift!" "Marriage a la Mode", "Strange Romantic Customs"
VG : thin 1/4" chip out center right edge, some abrasion at page edges, 1" crease bottom right, multiple small creases outer corners front cover, price penciled on back cover, overall very nice with wear at spine & moderate handling/surface wear. Complete, tight to staples (opens flat), good gloss, light tan pages with fairly sharp corners. Image of actual item shown. Bagged & boarded.